Vitne is the stage moniker of Jo Kimbrell, who is a singer, guitarist and songwriter hailing from Oslo in Norway. He has released a lot of music through his involvement in different musical projects, including the band Golden Palace. It was in 2013 that he launched his solo career as Vitne, teaming up with German guitarist Julian Angel, whose skills feature on this EP. He released his debut solo album, Neon, in late 2013 to critical acclaim. 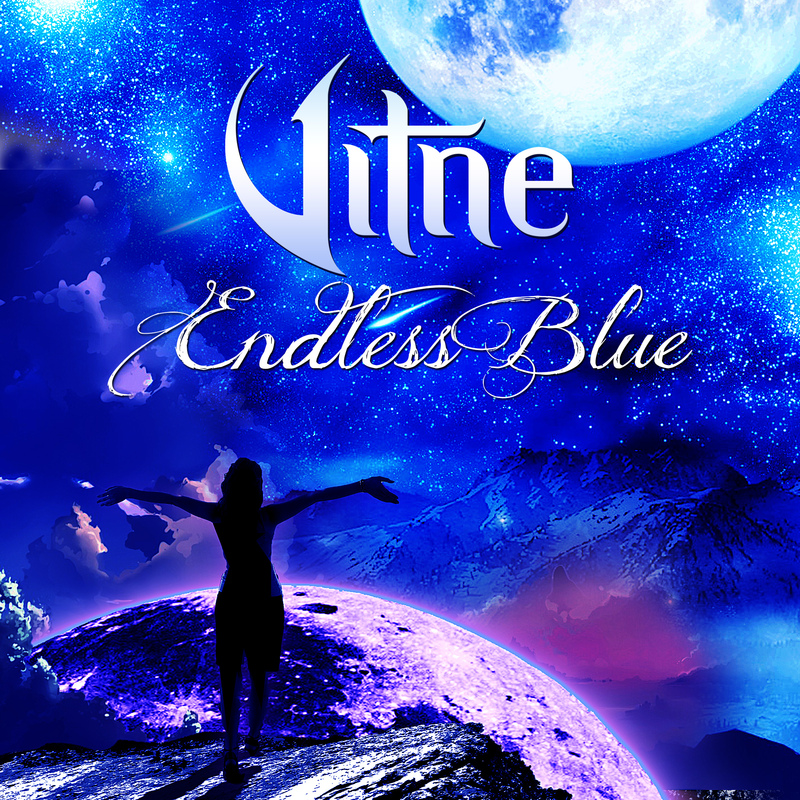 This six track EP, Endless Blue, is the perfect showcase for Vitne’s various talents and broad musical range. The tracks differ in style, but essentially you would describe his music as a combination of glam rock artists/bands like Billy Idol and Kiss with the more modern sound ofvpunk rock bands like Sum 41 and Goldfinger. There is also a sophistication to both the music and lyrics that you get with progressive rock and a certain theatricality; it’s no surprise to learn that Vitne is also an actor. The EP starts with the sound of rolling thunder on Rain Of Hope, a one minute instrumental comprising just guitar, setting the tone nicely for what follows. The title track comes next, and the contrast to the intro could not be greater. It begins with a pounding stadium/punk rock drum beat courtesy of Matthew Sean Reynolds, before a Sum 41-style lead guitar riff grabs the attention. After a short verse we soon hit the anthemic chorus, sung with fire and passion: “Just one more try and I will fight..sit staring deeply through the still of night, digging deep, trying to find you, never ending, searching for you endlessly in this endless blue…”. After a middle eight section that maintains the colossal energy, it breaks into an exciting guitar solo before one last blast through the chorus. A fabulous, uplifting song and an obvious choice as a single. This is immediately contrasted by Himitsu, Village of the Sea, which is a gentle folk acoustic ballad introduced with some gorgeous flute (played by Vitne). It’s about realizing how much you appreciate somewhere once you’ve left that place and contains some lovely vocal harmonies. A track that shows Vitne’s songwriting craft. This is then followed by Serenity, a four minute acoustic instrumental track. It is beautifully simple, a picked acoustic guitar melding with a haunting, poignant melody also played on the acoustic. This melody is then eventually taken over by flute, which works very effectively.Vitne says the inspiration for this track “came from role playing games like Chrono Cross”, which just goes to show that artistic inspiration can come from all manner of sources. Fifth track Misery is a return to the anthemic rock of the title track, this one not as fast and builds more gradually. Starting with just vocal and chugging acoustic, the electric guitars are not introduced till the second verse, which heightens their impact. It features an intimate and heartfelt vocal performance from Vitne as he depicts a struggling relationship in the lyrics: “I already know that it’s over..so try my best not to make believe, I feel alright though I’m not sober, I’m drowning in this misery…. “. Final song The Ocean is an interesting song to end the EP, another romantically themed track that incorporates the metaphor of the (endless blue) ocean as symbolic of the vastness of life’s emotional experiences. The lyrics honour a finished relationship, the chorus containing the poetic and poignant line, ‘Our love lies in the ocean….‘. Whereas it could have been arranged as a simple acoustic ballad, musically it lies halfway between the EP’s ballads and rockier songs. It’s an intense, powerful track and a suitable ending to the musical journey of this EP, giving a sense of having come full circle. Overall, this is a very accomplished and highly enjoyable set of tracks that manage to cover as much musical range and emotional territory as you would expect from a full length album. Vitne has an excellent voice and writes well crafted, intelligent music and lyrics that stand out as a cut above most rock music. His backing band all give superb performances that match the ambition of the artist – you would have to think its only a matter of time before Vitne breaks through to become a worldwide famous star. 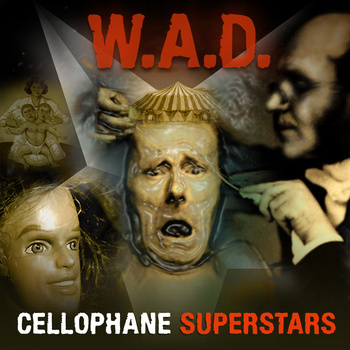 Cellophane Superstars are far from your average group. They are an alternative rock/avant-garde duo consisting of guitarist Aaron Kaplan and producer Ryan Summers, based in Central Wisconsin. They have an unusual backstory in that the members came together after their experiences involving religion and a New Age Cult. Aaron, raised a Jehovah’s Witness, risked alienation from friends and family to escape from the church’s teachings. Ryan, although raised as an atheist, became involved in a New Age U.F.O. cult. Their songwriting centers on the emotional difficulties involved in the deprogramming process involved in leaving such mentally abusive groups. This all sounds a deadly serious background to a musical project, but in fact Cellophane Superstars have a great deal of humour in their inventive music. They, to my mind, belong in a lineage of great American eccentrics, stretching back to Captain Beefheart (whose Magic Band also contained recovering former cult members), Frank Zappa, Sparks and They Might Be Giants, the latter two both being quirky duos also. Genre-wise, they are hard to define, mixing rock, dubstep, pop, metal and electronica, sometimes within the same song. It starts with an ominous sounding introductory track that begins with the rantings of a preacher while church bells toll, before a pounding dubstep beat kicks in. Over dissonant low guitar chords, we hear a lengthy scream then the repeated chant “Just another W.A.D…..praise be to God….”. Next comes the quirky pop of Swans Are Singing, which is seemingly about someone being entirely unaware of the situation of they’re in (possibly referring to cult/religious brainwashing).”This cocoon you made for yourself is about to be split in two….” goes the verse, driven along by rhythmic piano leading to an offbeat but catchy chorus: “The swans are singing in your ear, but somehow you don’t hear…”. The spacey synth sounds in that song get free rein in third track The Flood, taking up the first two minutes of the track. A pulsing four-to-the-floor beat leads to a gorgeous section of swirling, classical-style piano arpeggios. This is an impressive and actually quite haunting piece of music, blending genres in an original way and featuring a fine vocal performance. Next comes the title track which turns out to be one of the heavier songs on the album, with an almost Nine Inch Nails ‘industrial rock’ vibe as angular guitars and riffs duel with each other. The hook is gloriously simple but effective. It seems to be genuinely seething with anger as you catch lines like “Keep your head down, keep your mouth shut, that’s all they want in the end…”. The final minute is bizarre, the music speeding up as we hear female orgasmic moans over a jolly synth melody then a lengthy primal scream far more convincing than a thousand metal bands. Dark Reflection is an epic at eight minutes long and further expands the electro-rock template with the melancholy lyrics full of regret: “If I could look silently and see what might have been, if I would turn the clock back and wash away my sin….”. There is a genuinely poignant moment halfway through as the music becomes hymnal and we hear the final refrain, “It’s a dark reflection, nothing to see…”, before it brightens up with a stomping beat for the last minute. Imaginary Numbers is the Superstars at their craziest, bringing to mind the more eccentric moments of Todd Rundgren’s legendarily drug-fuelled A Wizard, A True Star album. Indecision, track seven, is slightly calmer but still bursting at the seams with all manner of demented noises. Musically, it is like a psychedelic waltz, but with a sense of claustrophobia, like someone wrestling inside their strait jacket. As Seen On T.V. is a depressing/funny song that veritably drips with sarcasm, satirizing the mind-numbing effects of television and the general intelligence of the many people seemingly hooked on it. It features some absolutely gorgeous acoustic guitar work in the middle (the musicianship is of a high standard throughout). Audio samples from T.V. programs add to the satire, with, of course, a subtle dig at religious channels. Don’t Tell Anyone is rather more disturbing, a deathly slow ballad seemingly about child abuse: “Just tell them crashed a bike into a tree…we both know I didn’t mean to hurt you…“. The final minute explodes into life but the effect is menacing rather than uplifting. Next, Some Human’s Ain’t Human is like psychedelic hip-hop but it’s a bad trip we’re on here, a mangling of electric guitars doing battle with electronic glitches and drones. The hook is one of the most memorable on the album and this track is perhaps the definitive example of the Superstars’ electro-rock fusion. Baptism By Immersion again references their difficult past and the mind-control that religions and cults involve, in a slow-paced epic with the telling lyrics “You gotta drown yourself to save yourself….” and at the end, “there is no final solution…”. Heavy. This leads into the final song Worlds Between, a melancholy tale of resignation about a failing relationship consisting of just acoustic guitar, accordion and vocal for the most part. About five minutes in, a beat kicks in for one last uplifting chorus, and just when you think it will build into a guns-blazing climax, it peters out into a minute of bewildering sonic weirdness. And somehow that’s the perfect ending. Overall, this is a very good, often challenging album that mixes and hybridizes musical styles in a genuinely inventive and original way, but also manages to traverse a wide emotional range. They come across as alternately humorous and eccentric, deadly serious and even morbid, sardonic and sometimes simply sad. It adds up to an emotional journey that takes some strange twists and turns but Cellophane Superstars have a story well worth hearing. 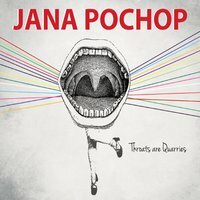 Jana Pochop is a folk/pop singer/songwriter from Austin, Texas and this EP Throats Are Quarries is her third, flawlessly produced by Daniel Barrett of the band porterdavis. Her music is a blend of traditional folk/country (and sometimes rock) with elements of the quirkier side of pop. Her dreamy vocals are somewhat reminiscent of Lisa Loeb, her lyrics mainly ruminations about life, some with a mystical edge that brings to mind someone like Conor Oberst of Bright Eyes. The opening song of the EP ‘When Your Soul Leaves Your Body’ is one of these spiritually themed songs. If the title sounds portentous, the song itself is beautifully simple, and lines like ‘When your soul leaves your body, don’t hold onto the handle bars’ make death sound like an effortless and easy transition, and something to look forward to rather than fear. Not a commonplace topic for what is still essentially a pop song, but all the more interesting for it. This song sets out her basic sound of slow-paced strummed acoustic guitars with minimal but always tasteful backing. Pochop’s distinctive vocals are placed up front which helps give her music a strong sense of personality. Second track ‘Throw You Forward’ has a similar lilting, dreamy pace with some nice instrumental touches like tubular bells. The theme of this song is love but dealt with in an inventive way lyrically: ‘You found the gateway drug, you called me beautiful’. Next track ‘Deepest Fear’ is at a more brisk tempo and is about the numerous self-doubts that we all battle with: ‘My deepest fear is that my fears are not that deep, they are just simple things’. Instrumentally, this adds plucked banjo and some nice lead electric guitar into the blend. ‘Middle of My Chest’ is the rockiest track but still very much a pop song, some quirky background synths helping to modernize the sound. Lyrically, this track is perhaps the darkest, depicting inner turmoil and desperation: ‘The middle of my chest is betraying me, where is the heart, so I can stick the knife…”. Closing song ‘Adore You’ returns to the more dreamy beginning of the EP, and features some lovely celesta-style descending melodies and a sparse but effective electronic beat. This one is the most conventional lyrically, but sidesteps clichés and the prosaic along with the other songs. Overall, this is an excellent EP without a single weak link. All the songs manage to juggle being commercial and ‘radio-friendly’ without ever being formulaic. I expect she will build a big cult following round the world.